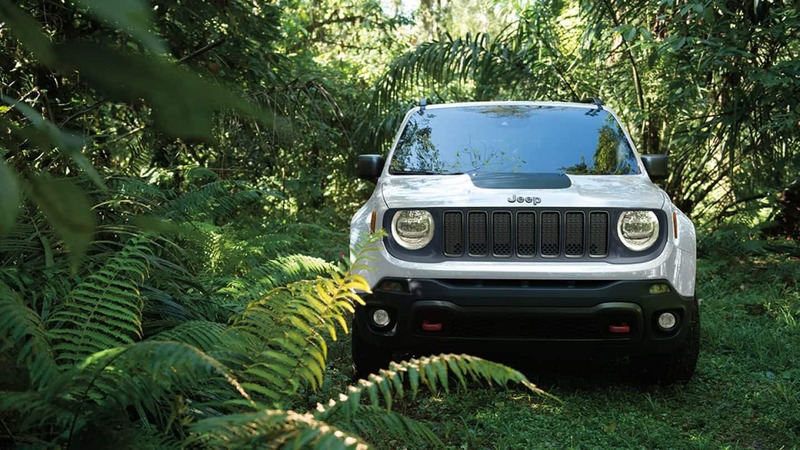 The Jeep brand is known for their go anywhere do anything attitude and the small sport-utility vehicle that is the Renegade does not disappoint. 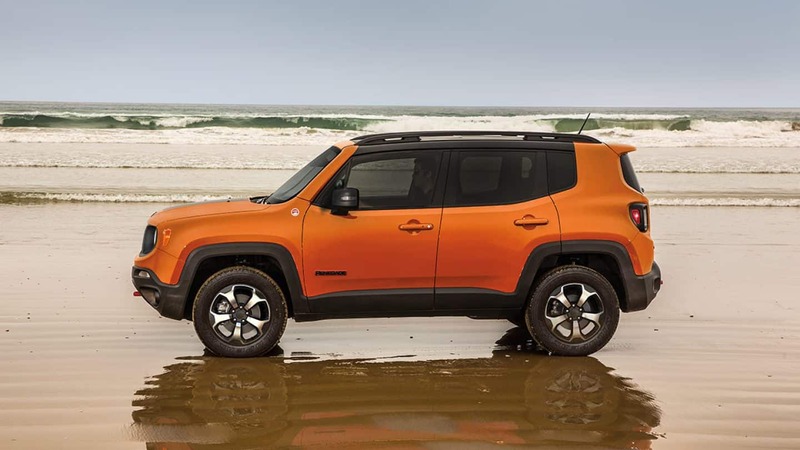 The 2019 Renegade kept all the impressive on and off-road handling abilities while adding a new turbocharged engine, new aluminum wheel designs, new front fascias and grille surround. Along with the Renegade's new exterior design all new exterior paint colors are now available including Bikini, Slate Blue, and Sting Grey. 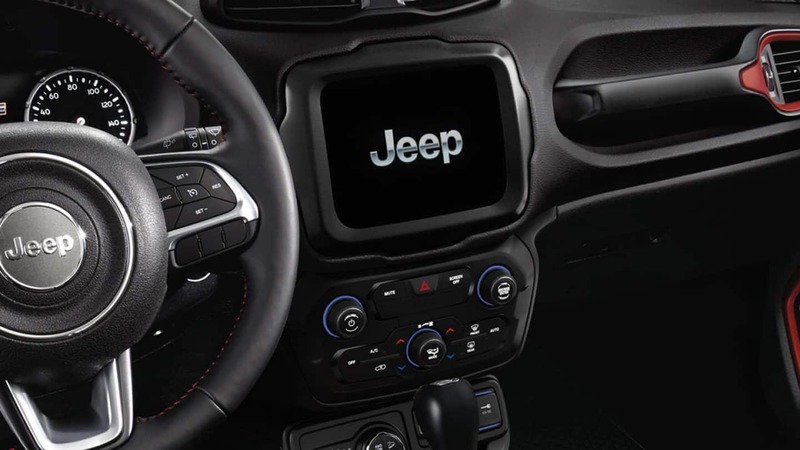 Keep reading to learn more about the 2019 Jeep Renegade. Jeep offers customers the 2019 Renegade in four trim levels including the Sport, Latitude, Limited, and Trailhawk. 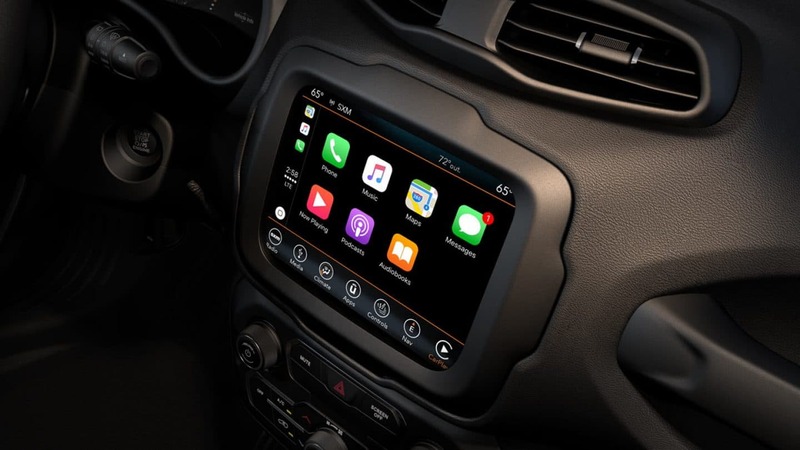 The base Sport model comes with a 5-inch touchscreen, Bluetooth, a rearview camera, fold-flat front passenger seat, 60/40-split folding rear seats, keyless entry, a six-speaker sound system, and a USB port. available packages include a Sport Appearance package, Power & Air Group package, and Uconnect 7.0 Group package. The Latitude comes with all of the Compass Sport features and packages including a 7-inch touchscreen, heated mirrors, roof rails, privacy glass, a leather-wrapped steering wheel, and second-row USB port. 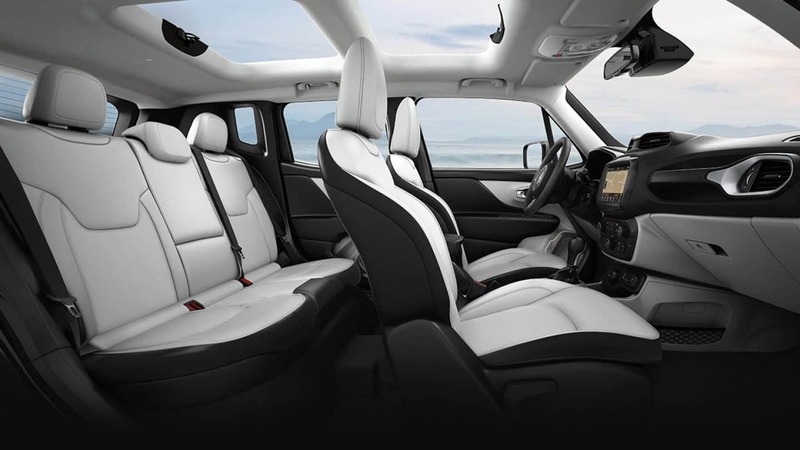 The Limited model is designed with luxury in mind with heated front seats, heated steering wheel, automatic wipers with de-icers, leather upholstery, a 115-volt household-style power outlet, and a 40/20/40-split folding rear seat with a center pass-through. The off-road designed Trailhawk comes equipped with a full-size spare, underbody skid plates, tow hooks, hill descent control, a raised suspension, all-season floor mats, and four-wheel drive with low-range settings. 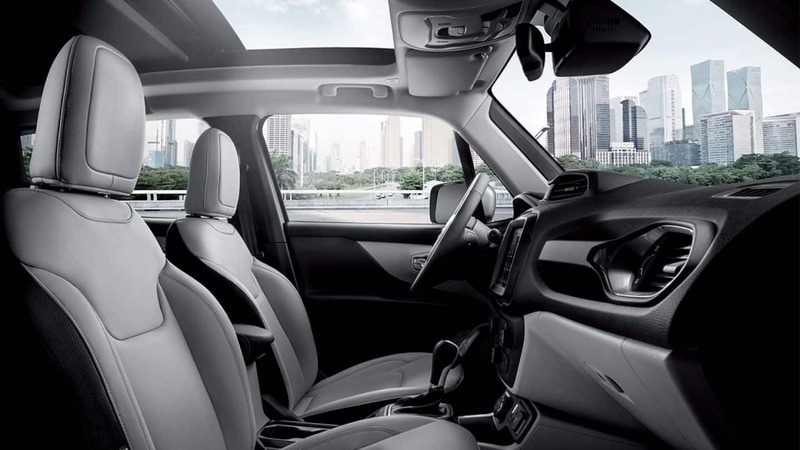 All trim levels have an optional open-air My Sky removable panel sunroof with two easily removable roof panels that store flat in the rear cargo area. What does the Renegade have for safety features? 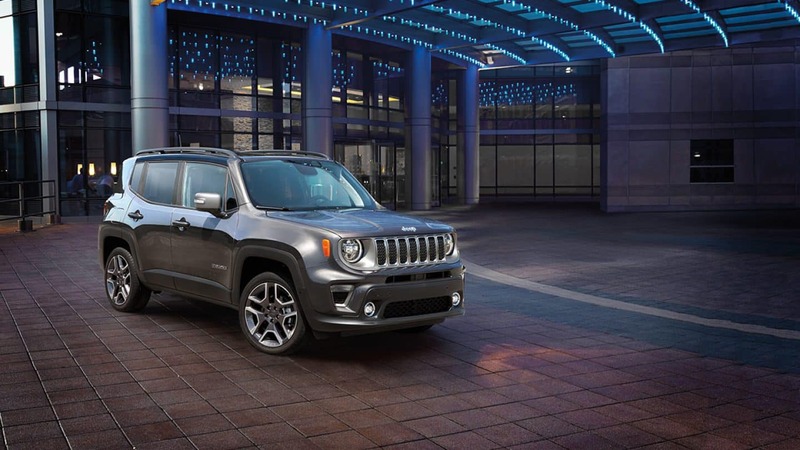 Whether you're backing out of your driveway, parallel parking in the city, cruising down the highway, or adventuring down trails you can feel safe and secure in the 2019 Jeep Renegade. Parking is made easy thanks to the Renegade's parallel and perpendicular park assist, front park sensors, ParkSense rear park assist system, and ParkView rear back up camera. 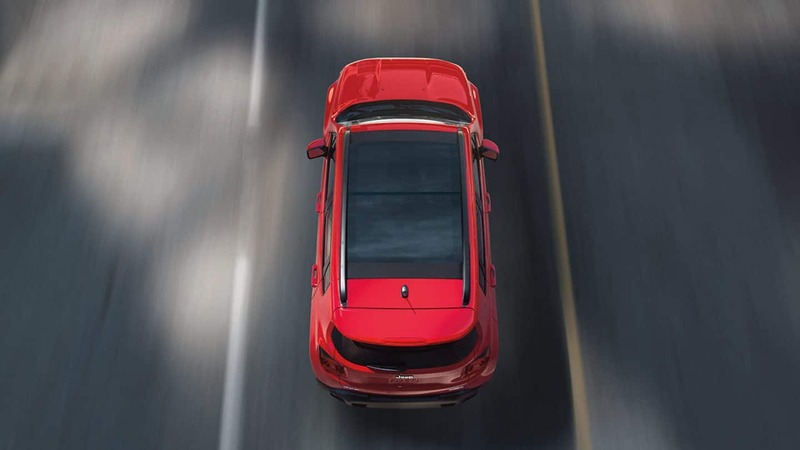 Available LaneSense lane departure warning with lane keep assist, full-speed forward collision warning with active braking, blind-spot monitoring, and adaptive cruise control with stop are some of the over 70 standard and available safety and security features the Renegade has to offer. What does the Renegade have for engines? The Renegade is ready for anything with impressive ride handling no matter what. The advanced steering system, standard nine-speed automatic transmission, and stiff body structure delivers a smooth ride on and off the road. The Sport and Latitude models come with a 2.4-liter engine producing 180 horsepower and 175 lb-ft of torque. While the Limited and Trailhawk versions come with a 1.3-liter turbocharged engine making 177 horsepower and 200 lb-ft of torque. Front-wheel drive comes standard on both engines with the option of four-wheel-drive. The off-road oriented Trailhawk comes standard with four-wheel-drive. Are you ready for your next adventure? The 2019 Jeep Renegade definitely is! Jeep's legendary 4x4 systems allow you to go anywhere while the advanced safety and security features keep you safe. We love the My Sky removable sunroof, luxury interior features, and the updated exterior. 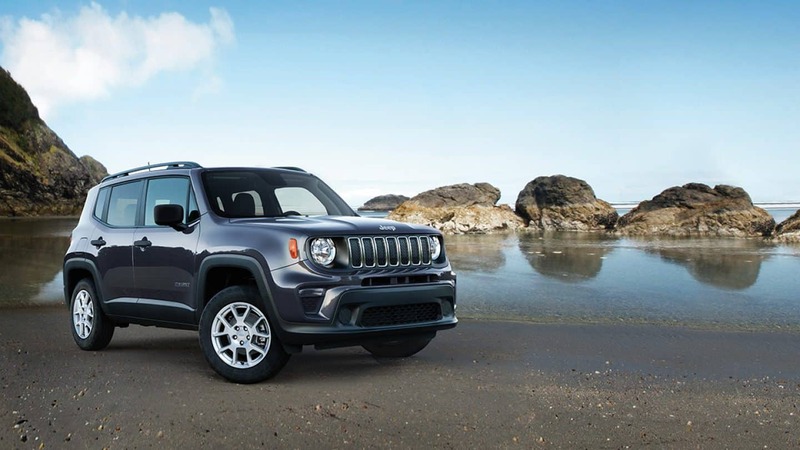 To learn more about the new 2019 Jeep Renegade stop on by the dealership and talk with one of our friendly sales associates.